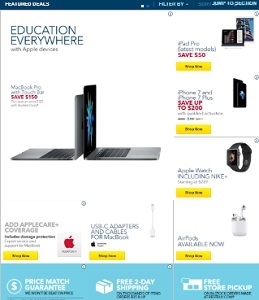 Explore this week best Best Buy flyer savings valid 7/30 – 8/5/2017: $849.99 Apple – 12.9-Inch iPad Pro (Latest Model) with Wi-Fi – 256GB – Space Gray; $649.99 LG – 55″ Class (54.6″ Diag.) – LED – 2160p – Smart – 4K Ultra HD TV – Black; $149.99 Insignia – 32″ Class (31.5″ Diag.) – LED – 720p – Smart – Roku TV – Black; $229.99 Lenovo – 15.6″ Laptop – AMD A6-Series – 4GB Memory – AMD Radeon R4 – 500GB Hard Drive – Black; $129.99 Frigidaire – 3.3 Cu. Ft. Mini Fridge – Stainless Steel; $69.99 Wacom – Bamboo Ink Smart Stylus – Black; $349.99 Lenovo – Flex 4 14 2-in-1 14″ Touch-Screen Laptop – Intel Pentium – 4GB Memory – 500GB Hard Drive – Black; $399.00 Samsung – 12.3″ Chromebook Plus – Touch Screen- 4GB memory- 32GB eMMC Flash Memory – Platinum Silver; $1,399.99 HP – Spectre x360 2-in-1 13.3″ 4K Ultra HD Touch-Screen Laptop – Intel Core i7 – 16GB Memory – 512GB Solid State Drive – Dark ash silver; $39.99 Hamilton Beach – FlexBrew Coffeemaker – Black; $139.99 Garmin – Dash Cam 45 Full HD Driving Recorder – Black; $199.98 Denon – Analog Record Turntable – Black; and more.